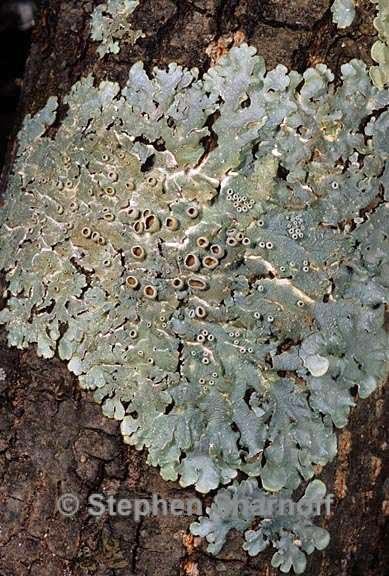 Thallus: foliose, medium to large, up to 12 cm, tightly adnate to loosely appressed, lobate lobes: subirregular, contiguous, seldom imbricate, plane, up to 5 (-10) mm wide, lobe tips rounded; rare specimens with occasional laciniae upper surface: bluish-gray to or light mineral gray, turning buff to medium brown in the herbarium with age, weakly wrinkled or ridged, rugulose with age; lobes sometimes with a shiny, narrow, brownish edge pseudocyphellae: white, rare to abundant, round to elongate, sometimes associated with cracks or elevated, up to 0.5 mm asexual propagules: none lower surface: whitish tan, pale tan to medium tan, sometimes darker toward the outer margins; rhizines: abundant often to the margin, simple to forked, thin, stringy and white or concolorous with the lower surface or darkening Apothecia: usually common (although occasionally absent), up to 13 mm in diam., concave, sessile to substipitate; disc: flesh-colored to dark red brown or rusty brown; exciple: smooth to cracked and "chinky", concolorous with the thallus, often pseudocyphellate asci: Lecanora-type, 8-spored ascospores: simple, hyaline, ovoid to ellipsoid, 10-17 x 6-10 µm Pycnidia: usually common (very rarely absent), black, seldom raised conidia: long, filiform, straight to lightly bowed, (7-)10-13(-16) x 1 µm Spot tests: cortex K+ yellow, C-; medulla K-, C+ red, KC+ red Secondary metabolites: upper cortex with atranorin (minor or trace), medulla containing lecanoric acid (major). Substrate and ecology: primarily in oak-pine forests on bark of various hardwoods (Acer, Alnus, Arbutus, Quercus, Fraxinus, Prosopis, Prunus, Salix, Willardia ) and conifers (Cupressus, Juniperus, Pinus, Pseudotsuga) between 700 and 2560 m World Distribution: North America and Mexico. Sonoran distribution: Arizona, Chihuahua, Sinaloa and Sonora. Notes: Although conidial size is significantly larger in P. hypoleucites than in P. graminicola (Culberson and Culberson 1980), P. hypoleucites also tends to have wider, non-imbricate lobes, abundant apothecia, slightly larger spores, and a corticolous habit in the Sonoran region.